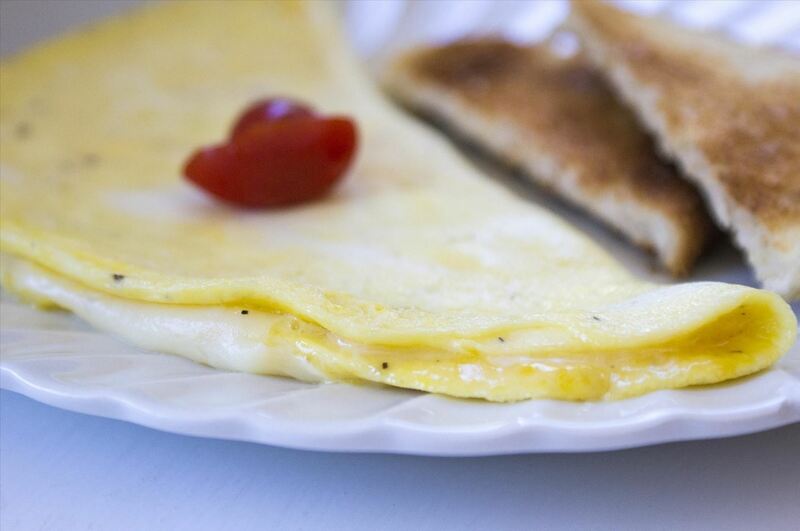 A classic French omelet is supposed to be completely cooked through with no brown edges. This is a delicate balance to strike, though. I always find that the moment I flip an omelet, it completely falls apart—unless it's so well-done it's rubbery, of course. However, I've found the perfect solution for your next great omelet that eliminates the flipping altogether. The secret is to cook the omelet on low heat with a covered, well-buttered pan. 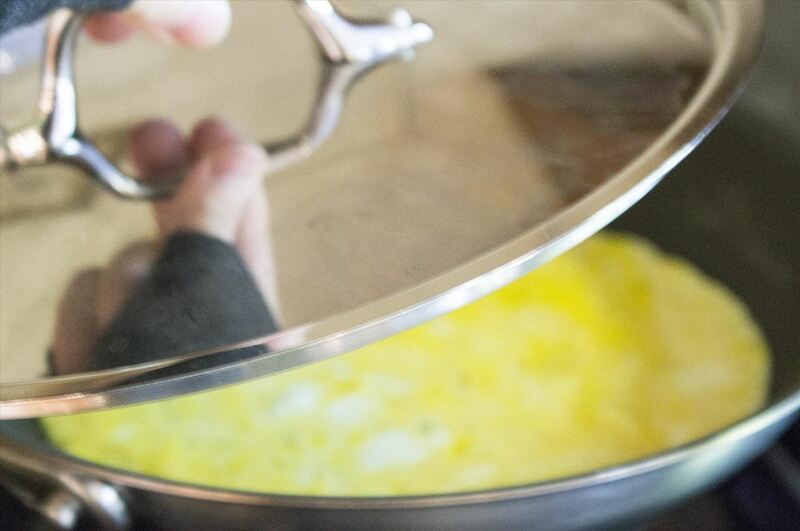 The lid traps the heat from the burner and heats the omelet evenly on both sides; it also locks in all of the moisture so that the eggs don't dry out. Whisk two eggs together in a separate bowl and add your preferred seasonings. If you'd like to fill the omelet with cheese, meat, or veggies, set them to the side of the stove for now. Heat a pan over low heat, being sure to spray or butter the surface of the pan well. Pour the eggs into the pan and cover with your lid. After a few minutes, open the lid and work a silicon spatula around the edges. I recommend this type of spatula because it contours perfectly to the sides of the pan instead of running into different angles, therefore breaking the egg. Before the whole omelet sets, you can tilt the pan slightly so that the runny egg can fill in the edges. Cover and check again in a few minutes. When the omelet is completely set (not runny anymore), add your fillings. Gently fold the omelet in half and cover again so that filling can heat through and cheese can melt. When the egg inside of the omelet has set but still looks shiny, your omelet is done. Slide the omelet out of the pan, onto a plate, and enjoy! Just like slow and steady won the race for Mr. Tortoise, low and steady heat will win your tastebuds over with this excellent French omelet hack. And because this hack requires little attention with long periods of waiting, you can multitask the rest of your breakfast in the kitchen: by the time your omelet is ready, your buttered toast will be, too. Mmm, nothing like perfect timing to start your mornings right. It's always best to make sure your eggs aren't expired before you cook with them, wouldn't you agree? Well, it's even more important to understand the labels on egg cartons first so you know what you're paying for. And like I mentioned earlier: I love omelets with toast, but I love the combination of the two—egg-in-the-hole recipes—even more.